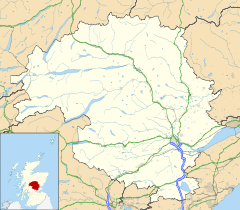 Ardler is a small village in Perth and Kinross, Scotland. It is situated approximately 3 miles (4.8 km) to the east of Coupar Angus, and approximately equidistant between the latter and Meigle. The present village evolved from a planned railway village called Washington, planned in 1835 in connection with the Dundee and Newtyle Railway. After initial building works Washington failed to expand as had been expected. In his history of the village Christopher H. Dingwall attributed this to the decline of the rural textile industry and the rapid expansion of railways meaning that Washington quickly lost its advantage of being one of the few settlements in the area connected to a railway. Railway rebuilding as part of the construction of the Scottish Midland Junction Railway led to the removal of the station at Washington village and its replacement with a station called Ardler slightly further away from the village. Following the establishment of a church and the foundation of the Parish of Ardler in 1885, the name Ardler superseded that of Washington. The church at Ardler was erected in memory of James Drummond Carmichael (1849-1881) by his father Peter Carmichael, a Dundee textile mill manager and senior partner in Baxter Brothers & Co Ltd. Peter Carmichael family had purchased the nearby Arthurstone estate in 1869 and expanded it to include other nearby farms including East and West Ardler. ^ Dingwall, Christopher H (1985). Ardler - A Village History. The Planned Railway Village of Washington. Dundee: Abertay Historical Society. pp. 25–29. ISBN 0 900019 20 4. ^ Dingwall, Christopher H (1985). Ardler - A Village History. The Planned Railway Village of Washington. Dundee: Abertay Historical Society. pp. 53–57. ISBN 0 900019 20 4. ^ "MS 102 Peter Carmichael of Arthurstone (1809-1891)". Archive Services Online Catalogue. University of Dundee Archives. Retrieved 27 November 2017. ^ Gauldie, Enid, ed. (1969). The Dundee Textile Industry 1790-1885. Edinburgh: Scottish History Society. p. 203. Wikimedia Commons has media related to Ardler, Perth and Kinross. This page was last edited on 26 September 2018, at 13:45 (UTC).